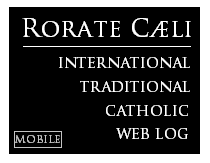 RORATE CÆLI: "A document has been signed..."
Yesterday, we closed our third and last update on the April 7 meeting with a note, from Archivum: His Holiness "has signed a document regarding the Rite of the Mass". One of our most trustworthy sources has finally broken the general silence and has confirmed that truly a document of great importance on the liturgy of the Latin Church "has been signed". 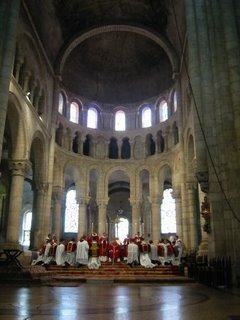 However, just as yesterday we mentioned "...the Rite of the Mass...", this source cannot or will not confirm if this document of great importance impacts (a) the Traditional Roman Rite (or, as it is usually called in more adequate terms, "the liturgical rite and discipline, according to the prescriptions of Saint Pius V, with the adaptations introduced by his successors up to Blessed John XXIII"); or (b) the New Roman rite (which, regarding the rite of the mass, was approved on Holy Thursday, 1969, by the Apostolic Constitution "Missale Romanum", of Paul VI); or (c) both rites. PS 2: We thank the dear commentator who was able to transcribe what would have been said at Radio Vaticana, though apparently later expunged from the official transcript. Amidst the report on the conclusions of the Assembly of the French Episcopal Conference regarding "the Traditionalist question" (see Update 1, item d), the reporter would have said: "...Ciò, soprattutto, in vista della pubblicazione del motu proprio del Papa sul rito della Messa..." (That is: "This [the measures towards Traditionalists] especially in view of the publication of the Motu Proprio of the Pope on the rite of the Mass."). PS 3: We apologise for not linking to specific published news sources in different languages, as we usually do, but this time we depend mostly on unpublished sources. Almost all Italian newspapers have remained silent. The usual online news sources have also been silent, except for ACI (see our Update 2), which did mention a few aspects of yesterday's meeting. We refuse to link to the Zenit or CWN reports which have absolutely nothing new. If it is true that the pope signed a document, I hope once and for all he clarifies the truth of the matter that the ONLY Roman Rite of Mass (i.e., the Traditional Latin Mass) has never been abrogated nor can ever be. In addition, no bishop can forbid a priest from celebrating it. Here's an interesting tidbit. The FSSP's Roman holy week celebrations have been moved from the obscurity of St. Gregory's to the prominance of the church of Santissima Trinita dei Monti, at the top of the Spanish Steps. And it's confirmed on their website. Interesting. "About those flying rumors that claim to portend something happening Holy Thursday. Picture this. We see Pope Benedict and his retinue processing in Roman-style vestments. 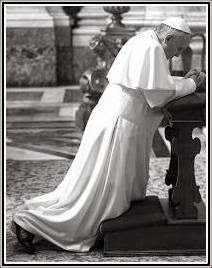 Bowing at the foot of the altar, he makes the Sign of the Cross and begins with the words Introibo ad altare Dei. Then I, for one, will take this as a concrete clue that something may actually be afoot." I think a good way for the Holy Father to demonstrate a new freedom for the old Mass would be to celebrate this Triduum with old-style Papal Masses (with the sedia gestitoria, flabellae, the fanon, and ... oh, yes, the tiara, but we know the chances of that are pretty much nil). How I would love to eat my words! That is not called "lovely", Jeff. That is called "condescending". You may leave these kinds of comments where they are. I think your comprehendometer is busted. Henry Edwards would be overjoyed if the old Mass were given freedom and if the Pope celebrated it on Holy Thursday. Nothin' condescending about it. By the way, any other comment in the "I don't believe it" line will be deleted. This is not a prophecy website: it is based in trusted sources, but it is written in a spirit of great humility, which is why we abhor condescending remarks. We have no problem in recognizing our mistakes, as you well know. None of this is a matter of belief or disbelief, but simply of information, information we try to collect as well as we can. Nothing matters to us more than the preservation of the Traditional Rites of the Church of Rome, for the greater glory of Our Lord Jesus Christ and His Holy Church. If you have have any credible INFORMATION -- either way -- please, feel free to share. May you have a very holy Holy Week! By the way, I would like to thank reader "minimus" for his observation (regarding a different matter). To me, the most meaningful thing the Holy Father can do is to publicly celebrate a Mass using the 1962 books at St. Peter's. He can write documents and "encourage" people all he wants, but the old adage of actions speaking louder than words is true. Just like Reagan challenged Gorbachev to "tear down this wall" -- we need someone to challenge the Holy Father to, "say this Mass". It doesn't mean "I don't believe it." It means, "I don't know--because I CAN'T know--whether it's true or not. So, I won't believe it til I see it." It's about the situation and the unpredictability of it. It's not ABOUT you. And it's VERY odd of you to take it that way. It's your blog, but it's hardly an auspicious beginning to Holy Week to start humor-policing your comments box. For us, the Mass is everything, and the whole world hangs on it. According to Canon Law a priest can only say one Mass a day (which in my opinion is dumb but oh well). It is not outside of the authority or the conceivable mental realization of a Bishop to say "okay, all the priests in my parish are required to say on Mass a day according to the Missal of Paul VI, and 3 every Sunday." That would more or less nullify any document the Pope signs unless he has already forseen the objection and done something quite smart like nullify the Canon or curb the Bishop's authority. I'm hoping and praying, but an informed evaluation advises caution. You raise a crucial point, and one that New Catholic and I have talked about quite a bit. However, we must burn that bridge when we get to it. Hmm...your "comprehendometer" was definitely on the fritz. Either that, or Rocco's been tampering with it. I've always said the trouble with Internet communcation is that there's no voice inflection. I've often misinterpreted comments directed at me, and often had my own comments misintrepreted by those to whom I've directed then. It goes with the territory. Just an FYI, I'm proud to be a personal friend of Henry. He has nothing but the highest respect for you as a resource, as do we all. He divides his time between the Novus Ordo during the week, and weekends at the TLM when he can get to it. That TLM, BTW, he was instrumental in obtaining through years of personally lobbying his bishop. He's the "godfather" of it so to speak; recruiting priests for its celebration, spreading the word by writing for its website, training its servers, and reaching into his private funds to provide it with the most exquisite vestments and precious vessels. He's done all this after a distinguished academic career in a major university, during a time of life when most would consider their debt paid. He's at once a man of great gentility, tenacity, and love of Holy Mother Church. Thank you again for the work you're doing. You're the longed for counterbalance to our friend in "River City" and the voice of hope for our future. Thank you for your comment, jon. However, I stand by what I said, though it was not said against anyone (and certainly not against Henry Edwards,who did not write the comment here, or Jeff), but against a certain mindset. All my fans and friends (I don't have benefactors) may be wondering at my "comments" pseudonym (this column should be labeled "commentary"). Here is the explanation. The appellation results from a replacement of the first letter in the name of one of Charles Dicken's meanest characters, Gradgrind, in his novel "Hard Times". "Trad" is, of course, an abbreviation for "Traditional," as in Catholic. No matter what they say, it doesn't matter!!! They can't be trusted any further than I can throw the dome of St. Peters. As the Jehovah's Witnesses say: AWAKE! What does it really matter? If a document is signed the novus ordo bishops will ignore it. Not that it matters anyway since there are few valid priests left to even say the traditional mass. The devil is giving a widespread use of the mass because he knows that the vatican ii revolution, which he inspired, has resulted in the virtual elimination of true priests. Welcome to the new springtime.